Philadelphia Dentistry offers comprehensive cosmetic dentistry, restorative dentistry, and preventive dental care at our dental office in Center City, Philadelphia. It is our privilege to transform the smiles of our patients and give them renewed self-confidence in their appearance and themselves. If you want to get a straight smile in Philadelphia and you want to use Invisalign to achieve it, the only dentist to see is Dr. Ken Cirka, an Elite Provider of Invisalign. Misaligned teeth are a problem, not only because you don’t like how your crooked, gapped, or overlapping teeth look, but because they impact your oral health. People whose teeth are not straight are more likely to suffer with tooth decay, TMJ, or enamel erosion. With Invisalign, you get a customized tooth alignment method that is discreet, efficient, affordable, and ideal for the busy adult who doesn’t want their life interrupted by the limitations of conventional braces. 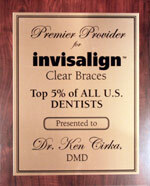 Plus, every Invisalign treatment is accompanied by professional teeth whitening. Straight, white teeth – what more could you want? One of the most versatile cosmetic dentistry treatments, porcelain veneers are often the only fix people need when they want to change the aesthetics of their smile. Veneers – or their counterpart Lumineers – cover up everything from stains and discoloration to chips and gaps, short or uneven teeth to worn or misalign teeth. One procedure, two visits to your Philadelphia dental office, and you can have a flawless, white, celeb-caliber smile that is natural-looking and durable. A smile makeover is personalized based on your cosmetic and restorative dental needs. Perhaps you are self-conscious of your discolored teeth and want a whiter smile. Maybe you have jaw tenderness and want to improve the function of your mouth. You might be suffering with tooth pain or loose teeth and need to rebuild your smile from scratch. Whatever your reason for improving your smile, restorative and cosmetic dentistry treatments help correct and prevent gum disease, tooth decay, enamel erosion, receding gums, and more. A healthy smile is a beautiful smile, and a flawless smile makes you look younger, happier, healthier, wiser, and accomplished. Life is good with a good smile makeover from Philadelphia Dentistry. There is a smile makeover solution for everyone. Whatever your complaints about the condition and look of your teeth, every dental problem has a solution. Too often, patients avoid seeing the dentist because they believe their teeth are beyond repair. This is never the case. Your smile can be rebuilt from the ground up and made to be fully functional and beautiful. Whether you are anxious about dental care in general, or whether you are embarrassed about the current condition of your teeth, at our Philadelphia Dentistry office, it is the goal of our compassionate and friendly dentists and staff to put you at ease. We give every patient the healthy teeth and gums that you are proud to display. Our Philadelphia dentists are known for their caring, experience, and expertise. 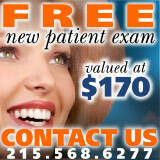 Your satisfaction is guaranteed at Philadelphia Dentistry. Contact us today to schedule your appointment or consultation.